There’s a lot of buzz about Frito Lay removing its “noisy,” but biodegradable bag, off the market. Sales are down, publicity is bad, so of course the bag should be taken off the market. 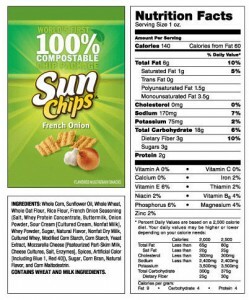 The fact is, many, if not most, of their chips contain artificial ingredients, including artificial color. People just don’t want this stuff in their food, and they have more alternatives than ever these days. Very nutritious. They think sales are down because of all the noise about the bags being noisy, not realizing that it’s the ingredients in many of the chips that are responsible.